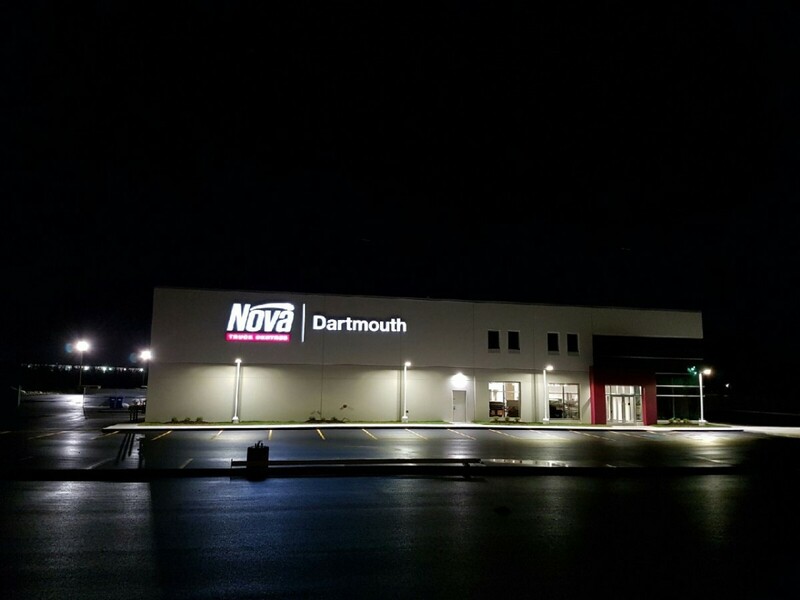 Nova Truck Centres have been selling and servicing commercial trucks for over 40 years. Whether you need a new truck or trailer, parts or service – they’re your one stop shop. Recently, they moved from two adjacent buildings on Thornhill Dr. to a brand new 40,000 sq. ft. facility on Wilkinson Ave. This facility is a state of the art, energy efficient, customer focused business place. It features a 2,000 sq. ft. parts showroom where customers can freely browse, along with a 7,000 sq. ft. warehouse to stock inventory. Nova Truck Centres are big on service – in an effort to improve the customer experience, they expanded from 18 bays on Thornhill to 24 drive through bays at their new location, one of which is dedicated to Express Assessment where they have a commitment to provide a preliminary diagnosis and communicate to the customer within 2 hours of arrival. Have a bit of a wait? No problem, they’ve also expanded their drivers lounge to include a laundry area, a quiet room, lounge facilities and showers. As in any new commercial building, part of their design included an eye catching and appealing signage package. After receiving a recommendation, they reached out to us for a signage solution. Account Executive Doug Mattatall used his vast experience and knowledge to come up with a beautiful west facing set of channel letters, a south facing ACM logo for oncoming traffic, and a 24’ double sided pylon sign. If you have a vision you want to bring to life—Mattatall are your go-to guys. You can tell that they love what they do and it shows in their work. They’re always great to answer all of your questions, walk you through the process, and meet your timelines and budgets. Building identification is very important to us – we want to ensure that your clients know where to find you, and if your business caters to truck drivers you need to make sure that is the case both during the day and after dark. The black channel letters facing Wilkinson shine a brilliant white at night thanks to 3M dual-color vinyl and white LED illumination. The pylon sign is an original design highlighting the three main brands carried by NTC (Freightliner, Western Star and Detroit) as well as a separate 10’ x 6’ header with Nova’s updated logo.